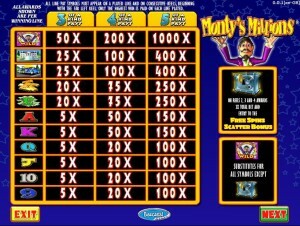 Monty’s Millions is one of the games designed by IGT, and it’s a luxury themed title. There is no shortage of slot machines which show you how the life of a billionaire is like, but in this case you get a main character as well, and of course he’s called Monty. The game seems like an older title, so you shouldn’t expect great graphics, and unfortunately that’s something that you want from a game that should scream luxury. 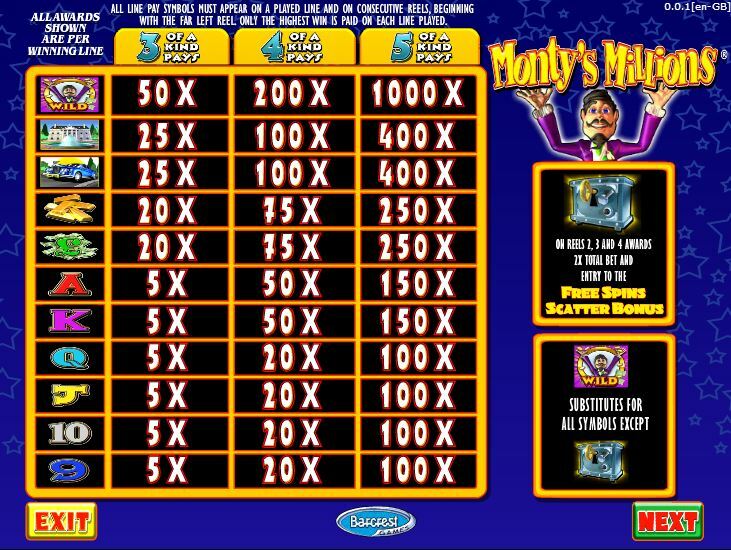 With 40 lines used, Monty’s Millions gives you plenty of chances to win its $10,000 top jackpot, but it seems a bit too expensive when you add it all up. 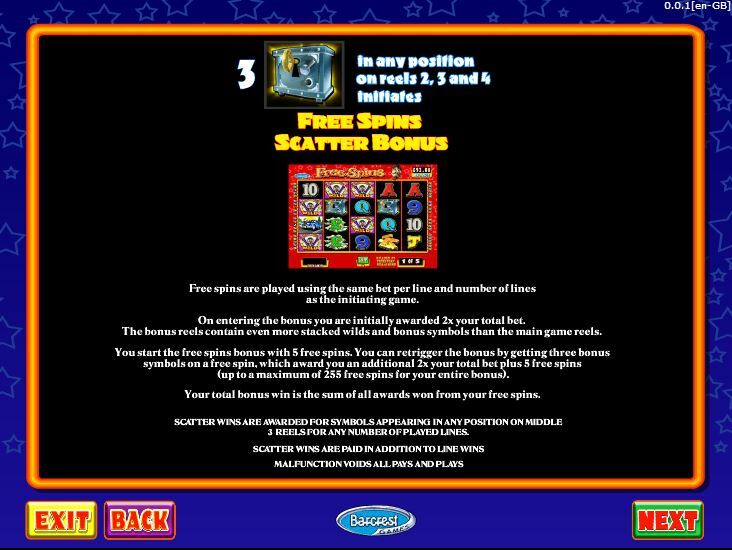 The features are also quite simple, including wilds and scatters which trigger free spins. The features are quite normal and easy to find in other slots as well, including one wild symbol, one scatter and a bonus feature with free spins. First, let’s take a look at Monty, the main character. He is shown in one of the symbols, throwing money around. This is the wild symbol, so Monty is always good news when he appears. He can form a combo of 3 to 5 symbols, paying up to 1,000x in the process. He is also used as a very simple wild feature, capable of taking the place of another icon but not being able to help out with the scatter. Even better, this is a stacked symbol, and can bring you up to four wilds on the same reel in the same round. The free spins are available here, and they give you 5 rounds for free when they’re triggered. Three Safe icons have to appear scattered on the centre three reels, in order for the games to be awarded. You also get a small prize when this happens, worth twice the value of the triggering bet. Retriggering this feature is possible, an extra 5 free spins being offered when the needed three symbols are present again. You choose the number of active lines that receive wagers each round, the minimum being 1, the maximum being 40. As for the stake per line, it varies considerably as well, between $0.01 and $10. The result is a game that can get expensive, with a $400 maximum bet, but which can be very cheap as well. 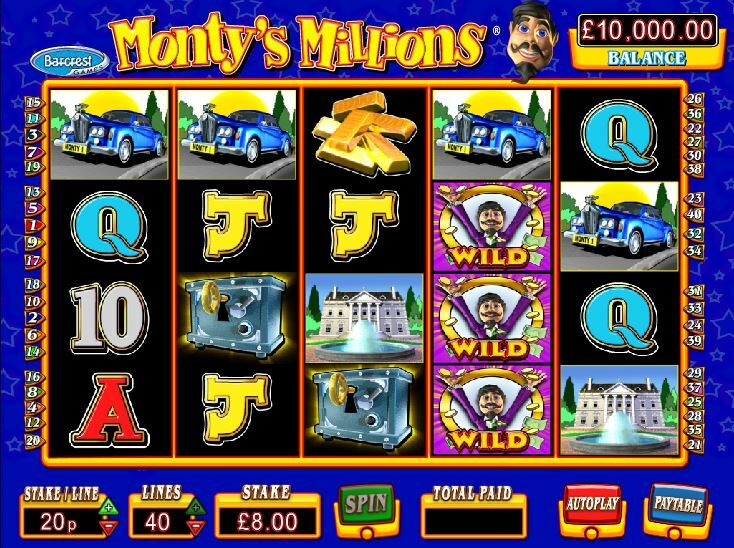 The slot’s best paying symbol, the wild with Monty on it, will offer up to 1,000 coins, in exchange for one coin wagered per line. You only get $10,000 cash in the best case scenario. The game’s design is the weakest part, despite the fact that it also has only a couple of features. The dated design will show you things like expensive limousines, mansions or gold bars, but playing cards are also part of it. Everything looks old, and I’m sure that about 10 years ago this would’ve been a decent game. It’s not the case now unfortunately. Symbols: Monty (1,000 coins, wild), Safe (scatter, 2x the bet), Mansion (400 coins), Limousine (400 coins), Gold Bars (250 coins), Cash Stacks (250 coins), Ace (150 coins), King (150 coins), Queen (100 coins), Jack (100 coins), 10 (100 coins) and 9 (100 coins). It’s an older game, with not as much to offer as a newer title would. You don’t get the right graphics, enough features or big enough prizes. 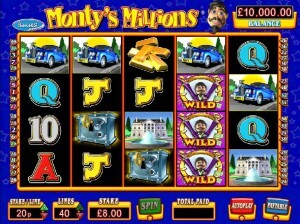 You will find Montys Millions at any online casino which chooses to use software from IGT, playable either for free or for real money.